We're thrilled to share the news that Airstream has just launched a new member of its iconic fleet dubbed The Globetrotter. The Globetrotter debuts this month with a list price of $99,000 and is a modern design enthusiast’s dream come true. The "silver bullet" aluminum exterior design remains, but inside it's all new. We can lend praise to Astheimer Limited, a U.K.-based design firm, for coming up with the interior design concept delivering four interior decor choices based on "dark walnut" and "natural elm" themes with cream, grey, blue, and slate color accents. Step inside and you'll be greeted with aluminum walls, panoramic windows, a curved headboard and cabinets, wraparound upholstery, Samsung LED high-definition TVs, a Polk audio system with recessed speakers, and backlighting throughout the trailer. On the exterior, a power window and awning package with Sunbrella fabrics is available. This gorgeous new model can sleep up to six people and features innovative Tuft & Needle mattresses to ensure a dreamy night's sleep. 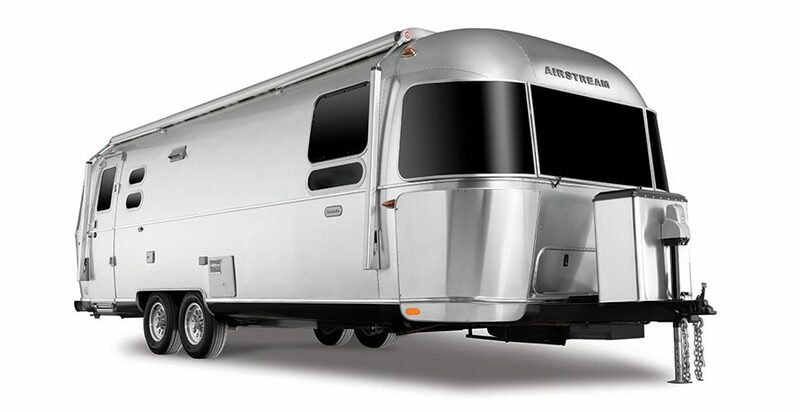 Peek some shots below to enjoy this beautiful new model from the quintessential Airstream brand. With its sleek, clean lines, elegant features, and intentional touches, it surrounds you in a style that feels like it was made for you, elevating each and every adventure you set out on. Oh and if we've inspired you enough to explore bringing an Airstream into your life, we stumbled upon this amazing couple doing it right in Mavis the Airstream. Check out their Instagram and some pics below to see how they transformed a vintage Airstream into a dream home on the road and be inspired to make the Airstream way of life your reality too.